Romelu Lukaku can’t stop amazing Manchester United fans with his shortcomings on the pitch, the star’s first-touch looks to have reached a new low. 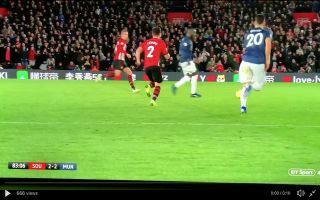 In the 82nd minute of United’s 2-2 draw with Southampton this evening, talisman Romelu Lukaku managed to injure himself as a result of his poor first-touch. The Belgian attempted to put his foot on the ball and control it but instead bundled over. Unfortunately for Lukaku his woes were caught on camera and the striker is set to become this weekend’s biggest meme yet. Lukaku did manage to break his scoring duck this evening. The striker hadn’t scored for 12 games for the Red Devils before this evening.